Peninsula Papagayo is the only luxury resort in Costa Rica, the beaches and club facilities and amenities are unmatched in Central America. Unlimited access to the world-renowned and exclusive member's facilities like the Prieta Beach Club and Arnold Palmer Signature Golf Course. Unique services within the Peninsula Papagayo Property Rentals program include resort charging privileges, daily housekeeping, L'Occitane amenities, pre-arrival & on-site concierge services and property management support. Our families have vacationed in Costa Rica the past three years and have found it to be an extremely welcoming country to tourists. Locals are friendly, English speaking and the American dollar is conveniently accepted. The Liberia airport houses many airline carriers and offers flights from numerous U.S. cities. Peninsula Papagayo is a short 25 minute ride from the airport and a rental car is not necessary as golf carts are available for rent and can be used for transportation while on the peninsula. Traveling from the northeastern part of the States and trying to escape the harsh February winter weather, we have found the Guanacaste climate to be spectacular during all three years we’ve visited. Every single day has offered cloud-free sunny days with temperatures in the low 90’s by day and high 70’s by night. Our concierge, Estefania, could not have been more responsive during our vacation weeks. She provides her email and personal phone number for all-hours access. Valuable services provided during our stay included transportation services, excursion reservations, extensive local knowledge and grocery delivery. We have never seen Estefania less than extremely friendly, cheerful, helpful and caring. The house accommodations offer everything you could ask for from a vacation property. The area is exclusive and completely private. Rooms are spacious and provide ample seating indoors and outdoors (sun and shade). The infinity pool is sizable and kept at the perfect temperature. Views from the home are magnificent and overlook the Pacific Ocean, mountains, Prieta Bay, the Four Seasons isthmus, Culebra Bay in the distance and even Monkey Rock. The home provides all necessary kitchen items, laundry facilities, daily housekeeping/pool cleaning and even a sound system that can be accessed with your smart device. While on property, we felt like we were in our own personal zoo. During the week, we saw monkeys, coati, deer and exotic birds. Activities within the peninsula are plentiful and include surfing, paddle-boarding, kayaking, jet skiing, boating, fishing, snorkeling, mountain biking, golfing and tennis. Activities off property are equally numerous and include zip-lining, ATVing, horseback riding, river tubing and water water rafting. Restaurant options, both inside and outside the peninsula, are also plentiful. Thanks so much for your kind words Jeff! We love that you enjoy our country, house and service so much! Every year we try and surprise you with a new activity and we are sure you will all have a blast! It has been wonderful having you and your families during the past years! This house is your home now! You are always very communicative which makes my job easy, and live the Pura Vida life to it's fullest! We love this property! We went back for a second year and booked a 3rd already for 2019. Well maintained, beautiful views, terrific accommodating staff at PEXS. We had 2 families with a total of 8 people and plenty of room. We rented golf carts this year rather than a car. Everything you need is reachable via the carts on the peninsula. Truly the best vacation either family has ever had. Thank you very much for your review!!! Our commitment is for each guest has an excepcional and unforgettable vacation. I hope you visit us again, and we will make sure that each time your experience is as good if not better than your first one. The interior is very well laid out, spacious and well-maintained. The property is private and offers some of the best views from the peninsula. It's location is convenient to all amenities and activities (golf, beach, biking, tennis, zip lining, horse back riding, jet skiing). The property managers have been extremely responsive, helpful and friendly. Thank you very much for your review, and thank you for choosing PEXS as your supplier of luxury homes in Costa Rica. For us is a pleasure to have you with us. Our concierge team, Ruddy and Estefania, were also delighted with your stay. We hope that if decide to come to Costa Rica again that you reach to us, so we can provide you with our personalize service and create once again a great memories and experiences. I cannot explain how incredibly beautiful this home is and how comfortable my stay was here. It's called the Pericos! 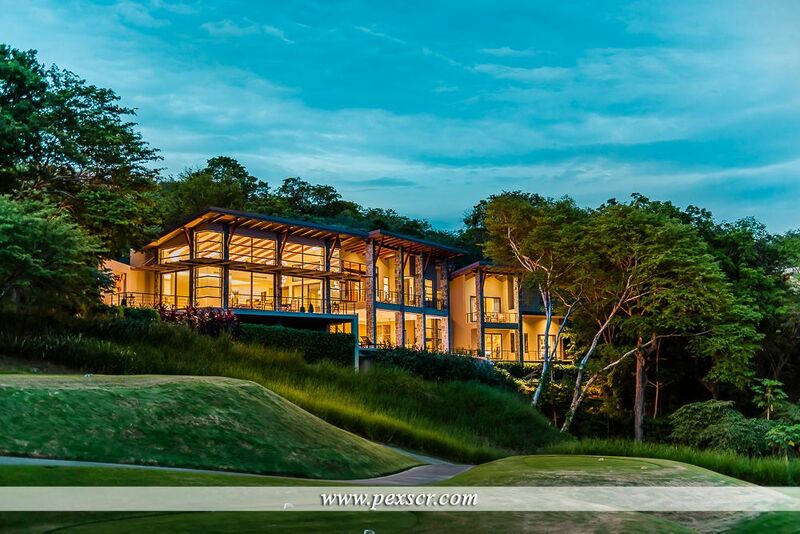 It is situated in the hills of the peninsula papagayo, a very upscale, gated, quiet community that all of the elite homes are in. The views from the house are breathtaking and I couldn't get enough of the evening sunsets shimmering on the water and on the incredible edgeless pool!! Each room is so neatly and perfectly decorated and the bathrooms are all very large in size and have a modern feel to them. The master bedroom you will never want to leave because of the views, the comfortable furniture and the bathroom is gorgeous! The landscaping and grounds are spectacular and immaculate and just look beautiful! The staff is great and they are always there to get you whatever you need. They are all very friendly and they keep everything spotless. Meghan was the chef we hired and the food she prepared was better than dining at any 5 star restaurant! Absolutely delicious!! The pool was a perfect temperature and felt so wonderful and refreshing! The edgeless pool is gorgeous and at night it feels as if you were going to swim into the sky as it is all lit up with stars! The weather was perfectly 85 degrees there. The slight breezes that come through make it the perfect, most tropical paradise in the world! Pexs is very attentive to the renters needs and is a great team to work with! They speak both english and spanish which makes it a lot easier to communicate. They are all about making it a vacation that you will love and remember and want to come back to! I would recommend this vacation rental to anyone because it is truly an amazing, magical place!! $1600-$3100/night. Please contact us for rates, availability & promotional offers.